Goodday. 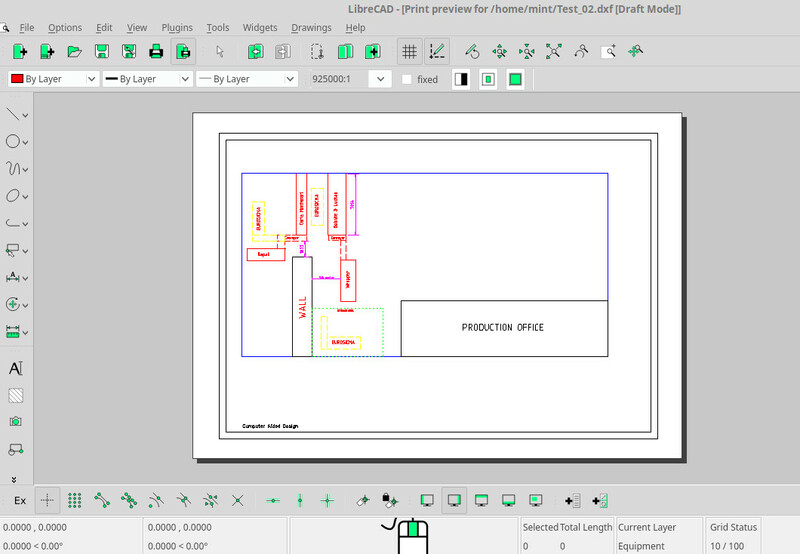 New user to CAD & Librecad. 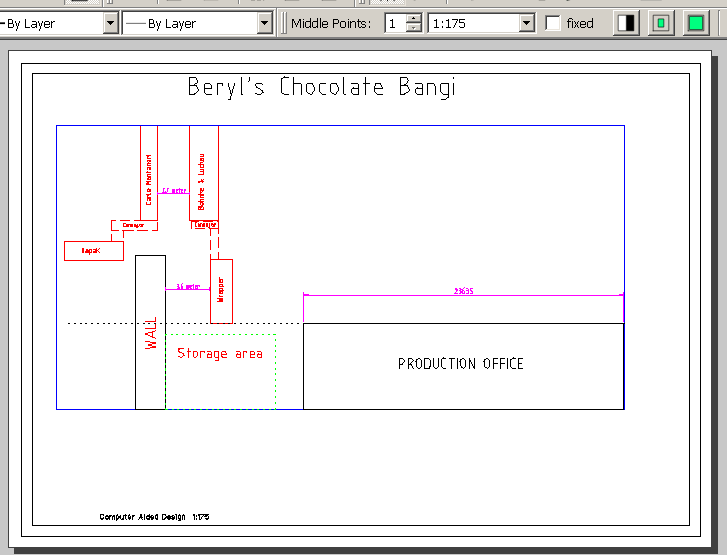 Currently i'm working on a 2D factory layout drawing. Using mm as unit on A4. So far the below snap shot is done with standard setting. Let say if i want the office dimension to show as 23635 instead of 135, what need to be done? Is there any way to scale it up 1:175? If you want to let the drawing otherwise be as it is, you could set "Length Factor" in "Current Drawing Preferences" - "Dimensions" to "1/75". This manipulates the reading of the dimension text. But if you measure it in the drawing, it will give the original value. The better way, and how it is generally done in CAD, is to draw in the real dimensions, so in this case to draw that office box 23635 mm long. If you don't want to redraw everything, or got it from a different source, you can scale up the whole drawing with Tool - Modify - Scale. Your dimension lines will have to be rearranged a bit after that. The downscaling to 1:175 to fit onto A4 is done in the printing process. Open Print Preview and set the scale to 1:175 at the drop down menu (type it in). Then drag the drawing to the right position on the A4 sheet and click on Print while still in Print Preview mode. Thanks dellus, by altering the length factor to 175 it does the trick. I did encounter some issue when printing the drawing. Did a few a attempt to adjust the paper format, either the paper is much bigger than drawing or the drawing is too gigantic for the paper. Somehow when i change back to A4 the software automatically scale the drawing accordingly and now it work fine. I guess the print preview scaling has been adjust by the software somehow. I did try to draw using the real dimension. The drawing is so massive that i need to zoom in and out very frequently. Is there any good LibreCAD tutorial on drawing real dimension 2D plan? I looking around youtube and mostly found tutorial on autocad. There are also some tutorials in the wiki which go more into detail, but are about older versions with a bit different user interface. If there is not more on the drawing than on your screenshot and there is no company secrets issue, you can provide the drawing file here. I then can rearrange it for real size dimension and A4 printing as an example for you, that's easier for me than to explain a lot. I guess the file was named "Test" because you wanted to test me. The units in your file was nanometer, not millimeter. It took me a while to get everything right, approximately. It was not possible to find the exact scaling, as the dimensions measured in the drawing were all uneven values, so it was not possible to guess what the intended value was. Also the frame for A4 seemed to be laid out for 200 x 287 mm, accidentally? So don't take this as all correct, but as a sample for the general layout as a true size drawing. 1:175 is an unusual scale, better go to 1:200 instead, easier to measure on paper with a standard ruler. I can help you with an empty 1:200 A4 in mm template if you like.